These guys have been sitting on the painting table in various states of disrepair for some time, so I finally sat down last weekend to get them finished up. I was really happy with how they came out. I'm not entirely sure they will ever be a useful, or rather, an efficient, use of points on the actual battlefield, but I just fell in love with trying to execute on the concept. 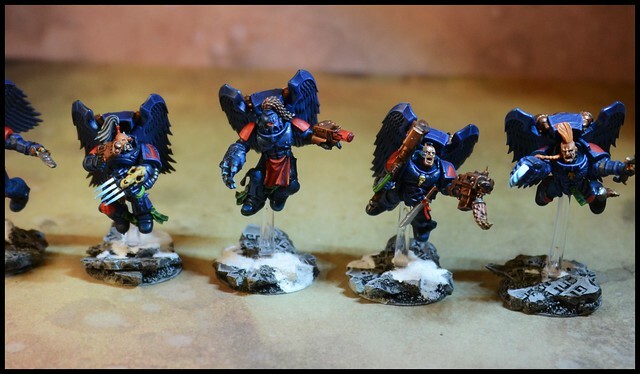 I liked the idea of a group of jump pack troops in motion, and combining the Blood Angel wings with the more aggressive sculpts of the Space Wolf models allowed me to create a much more dynamic set of poses. This was a case where the kitbashing came together well. Rounded things off with some interesting bases from the bits box, and everything ended up almost where I imagined it at the start. I was also very pleased with how well the faces worked, I often struggle to get the level of detail I'd like to with non-helmeted heads, but felt these guys worked out well.